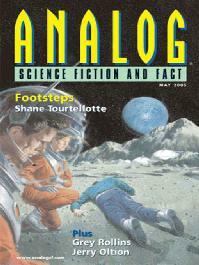 A lunar variation on the Locked Room Murder Mystery – except that the dead body is on the moon’s surface, quite some distance from the nearest building – the body is not wearing a spacesuit, and there are only his footsteps in the regolith. So how did he get there? Grey Rollins. Death as a Way of Life. From a Locked Room Murdery Mystery, to a murder mystery case for a hardboiled, wisecracking PI. Investigator Jack Rollins returns (‘Or Die Trying’ Analog Feb 2001), a PI who has been cloned and whose sidekick are multiple backups of himself lurking on the net. The murder victim is someone who had a highly rated TV show in which he dispatched himself on a weekly basis, to be returned in a cloned body for next week’s programme. James Van Pelt. The Inn at Mount Either. A wonderful holiday at a hotel which offers timeshifting trips to quantum alternate realities goes badly wrong when Dorian’s wife gets lost. Not just lost in the hotel – lost amongst the multiple hotels. After some panicky searching, Dorian is reunited, but has a sneaking suspicion that the wife which he has now isn’t exactly the wife he had previously. A short, melancholic piene in which a strange alien intelligence stumbles upon the ruins of humanity, and ponders, and we are left to consider our failings. Richard A. Lovett. Tomorrow’s Strawberries. Bill reflects on life now that Fermi’s Paradox has been explained – having finally triggered the criteria for being contacted by other beings, Earth is now swarming with aliens, and real estate is getting very, very scarce. Bill is constrained to a very small apartment in a very, very high high-rise, and in his old age he years for the open spaces – which he can obtain, but only for a short time, and at a high price. Ekaterina Sedia and David Bartell. Smiling Vermin. Further adventures of Gus and Jessie, whom we met last only two months ago (‘Alphabet Angels’ Analog March 2005). In that story Gus had been genetically modifying fish, and now he is working on ever so cuty teeny dolphins. However, these become very desirable objets, and dealing with the Yakuza isn’t something he had planned on. Quirky as the previous story, although my reading the two just a few days apart probably didn’t do this second story any favours. Hmmm, remote controlled lunar robots have taken on a Wild West life of their own. If you liked the humour in the 80s film ‘Short Circuit’ (Number 5 is alive) then you’ll doubtless enjoy this rootin-tootin’ drama.